I am absolutely smitten with all of this month's new releases and I can tell by the excitement that some of you have shared with me that you are too! A big thank you to each and every one of you who have joined us tonight during release festivities as well as the last five days of countdown fun! To finish up this exciting celebration, we're giving away a fabulous prize package tonight! Practically the entire October release! All you need to do to have your chance to win is post an answer to the following question in the comments section below. Congratulations to Cassie K! Please be sure to contact Customer Service with your shipping information so we can get this prize package out to you! And thank you again to everyone who joined us tonight and played along! Happy stamping! I love “O Come, Emmanuel” b/c of the minor key that really shows Israel’s longing for a Savior. I love O Holy Night! When it’s sung well it is so moving and beautiful. Oh! ‘Winter Wonderland’ for sure. My favorite Christmas Carol is Once In Royal David’s City. It just reminds me of angels singing, and I love the tune. Thank you so much for all the wonderful inspiration this month. It has been a fun, fun week! 😉 Can’t wait to get me some new PTI and get inky! Boy, that is a tough one! I’m partial to sacred carols. Silent night is always lovely, but I also love O Little of Bethlehem. O Holy Night is gorgeous too! I really love white christmas. I was never a huge holiday person until I met my husband. He really started traditions I had missed as a kid and now we have homemade hot chocolate and listen to christmas carols as we decorate the tree and it doesn’t feel like christmas if that hasn’t happened yet. especially when Johnny Mathis sings it. I don’t know if I have one particular favorite — there are so many I like!! Silent Night is the first that came to my mind, though… So lovely, so calming! Thanks for the chance (fingers are CROSSED!!! )… 🙂 Looks like a great release! I totally love Jingle Bells. Even the silly kid versions my son likes to sing. My favorite Christmas carol is “It’s Beginning to look a lot like Christmas.” My daughter loved it when she was little and it has just become our favorite! One of my favorites is O Holy Night because of the message and the granduer of the song. Grown-Up Christmas Wish…I just love the lyrics. It always puts me in the spirit. O Holy Night ~ it is the Reason for the Season! Jingle Bells is always such an uplifting song and really puts you in the Holiday mood But Silent Night sings out the true meaning of Christmas! My favorite Christmas carol is “Oh Holy Night” beacuse it reminds me of what Christmas is really about. i love Rudolph the Red Nosed Reindeer. It just reminds me so much of being a kid and singing it in school. My son Owen just started chorus this year and I can’t wait to hear him sing all of the holiday songs at his first concert. I love Joy to the World. Just a wonderful reminder of the true gift of Christmas and the joy that Christ’s birth brought to the world. I love Good King Wencelas (sp?)! When I was in elementary school – MANY years ago….we used to sing Christmas Carols in the hallway during lunchtime and that was one of my favorites – everyone singing it altogether was always my favorite! It has to be “Little Drummer Boy” as sung by Bing Crosby…..my grandmother’s favorite Christmas song. It always makes me think of her. Wow, tough one, as I love so many! I can definitely say that I prefer the religious ones to the secular ones (though I like those too) I’m going to say O Holy Night because it is so powerful in lyrics and in music. One of my favorite versions is sung by Celine Dion…it takes my breath away. Silent Night, but I’m not sure why. It just seems so right, and peaceful, serene. I can’t wait to order! LOVE all the new things! You are are so talented and wonderful. THANK YOU! Sleigh Ride!! Like Erin, I played it in band every year for our parade. I love all versions! A great release this month, Nichole! Congratulations! My favorite Christmas Carol is “O Holy Night”. When I was young, I even asked our pastor if I could sing it to the congregation! He did not pursue my request, thankfully! I would have been overcome with embarrassment. I can not sing at all!!! God Rest Ye Merry Gentlemen is my favorite. Not sure why, but it’s been a favorite since I was little. Deck the Halls. Gotta love those fa la las. And not to sing, but for listening, “carol of the bells”, especially in the first “Home Alone” movie. Love. Oh…my favorite is Bing Crosby’s “White Christmas.” It just fills the room with the idea of sleigh rides, snow, and memories of many wonderful Christmases! Thanks for the great release this month! I guess if I had to choose one I would have to say ‘Silent Night.’ The song explains the whole reason for the season. My very favorite is not that well known. It’s called “Breath of Heaven”. I think I first heard it from Amy Grant, but it is amazing. It totally reminds me of the miracle of Christ’s birth! Oh Holy Night, sung by Michael Crawford because his voice is magnificent and worthy of the song. O Holy Night is my favorite Christmas song. It is just beautiful and gives me chills whenever I hear it. Dolly Pardon’s Hard Candy Christmas because it reminds me of my mom! I like Mariah Carey’s All I want for Christmas. It is fun, upbeat, and different. Right now it’s Winter Wonderland, but I think that’s because I’ve been checking out the meadow stamp set for this release every 5 minutes and the song gets stuck in my head every time! I love Mary Did You Know, the Kenny Rodgers/Wynonna version. It is just a beautiful song! Not traditional, but mele kalikimaka. My mom would put the Bing Crosby record on every year while we decorated the tree (a tradition I continue, with the CD, LOL) and when that song came on, we all sang it together. Good memories. Great question! For me it’s O Holy Night, sung by a full SATB choir. I just love the multipart harmony–sends shivers down my back! We Wish You a Merry Christmas. Because my family and I truly wish the merriest of Christmases to our family and friends. The song says it all. My favorite is O Holy Night. It’s just beautiful and keeps me focused on the true meaning of Christmas! Blue Christmas by Elvis is definitely one of my favorite Christmas songs. I don’t even know why. I just remember hearing it come on the radio during the holidays when I was a little girl (usually when it was snowing) & it would just make me so happy. I love Hark the Herald Angels Sing because I can remember first learning how to play it on the piano when I was little! But my favorite holiday song to listen to is Santa Baby, it’s just so fun! All my favorite holiday songs are the hymns I sang in church when growing up. I think they are all so beautiful! O Holy Night is my favorite. It’s a beautiful song that expresses the true meaning of Christmas! Christmas Is…by Lou Rawls always gets me in the mood for holiday cheer! It’s a jazzy swingin’ lil tune! White Christmas. I love the movie and Bing Crosby just does a great job singing that song. Makes me really wish for a white Christmas! Mary Did You Know. Just brings to mind what an amazing situation that she was put in and the faith it took to go forward. Mine is “Carol of the Bells” sung by a children’s choir. It is just the most amazing and beautiful Christmas song and immediately makes me feel like a night where the snow is falling and I can see the Christmas lights on the houses. In fact, now that I think about it, it is not too early to get out the CD is it? I love O Holy Night- it has been one of my favorites forever. I love how beautiful the music is, and it’s a true Christmas song. My favorite Christmas song lately has become Handels Messiah. I love the song normally, but my son loves violin and when an orchestra plays it, I love watching him enjoy the music and fill his soul. I love Jingle Bells…I used to sing it to Alex when he was a baby. The first song that popped in my head when he was fussing. Now he knows the words, too, and loves to sing it any time of the year. Dreaming of a white christmas bc our family loves to ski. It’s hard to choose just one Christmas carol as my favorite. I’ve always sang with a choir, so music plays a huge part of my life, especially at Christmastime. I would probably have to say “O Holy Night”. It is such a beautiful song with great meaning. I love What Child is This, it was my grandmother’s favorite song and she always sang it to me on Christmas Eve and time leading up to Christmas, brings back wonderful memories of my beloved Grandma! Rudolph the Red-nosed Reindeer because it’s the first song my children learned to sing and it was just so cute! Angels we Have Heard on High… I have wonderful memories of my mom playing that on the piano when I was younger and it set a wonderful mood for Christmas. Easy question – my favorite is “Joy to the World”, played on a pipe organ – LOUD! I get goosebumps every time the chorus starts. Definitely Carol of the Bells. It is just such a beautiful and powerful song, especially when sung by an excellent chorus. My fave is Carol of the Bells. I just love the harmony of all of the voices together. It is so beautiful! I also love O Come Emmanuel! And for many of the same reasons that Sue posted. This sense of waiting and expectation in the song and then, the promise in the chorus, Rejoice, Rejoice! So powerful and moving. My favorite Christmas carol is White Christmas. It was sung by Bing Crosby who reminds me of my father who I lost when I was 9 years old. Plus, I love the song and the movie! I love Still, Still, Still. It is just so peaceful and hopeful. I know that it wasn’t really snowing in Bethlehem, but I still love the song. It’s nice to have the new nativity sets and dies this year. Thanks! I love Silent Night! It’s always the last song song at our Christmas Eve church service. All the lights are turned off and the congregation sings by candlelight. One of our choir members has a beautiful soprano voice and she always starts off with the first verse. Such a wonderful moment to look forward to at the holidays! I love ‘its beginning to look a lot like Christmas’ and I play it while we put up our decorations each year! Really puts me in a festive mood! Love it! It’s so hard to pick just one! I love to sing Hark the Herald Angels Sing because all the ‘gloria’s are so inspiring and uplifting. I love In The Bleak Midwinter because a tenor in the congregation sings it beautifully at Christmas Eve service in my church every year. And I adore Bring a Torch Jeannette Isabella. I think my favorite Christmas carol would have to be “O Holy Night”. It just seems to capture to essence of that very special event on that very special night. I can’t get enough of it at Christmas time. My favorite Christmas Carol is “O Come All Ye Faithful”. It is majestic and moves me to remember what this Christmas season is really all about. One holiday song that brings back some fun memories is “Grandma got ran over by a reindeer”. My grandsons used to want to listen to this over and over. They would try to sing along and have soooooo much fun!! O Holy Night.. That’s why I am soooo excited about this release. I love the nativity sets you are releasing. Silent Night is my favorite Christmas carol. It reminds me of the stillness of the night and how to most it was an ordinary night that turned holy with the birth of the Babe in Bethlehem. What a night that changed the world. “What Child is This?” is my favorite because the lyrics are so meaningful and the tune (Greensleeves) is haunting as well as beautiful. That is a tough one. I like many Christmas carols but I think I like “Do You Hear What I Hear” best because it is so lyrically beautiful. Great release! The Christmas Song is my fave secular song probably because I used to listen to it on an old LP record when I was a kid. I think it was a Perry Como Christmas album. I would listen to it over and over! It would have Silent Night Holy Night. It was all those years of Catholic school Christmas concerts. I’m a Christmas song nerd and know lots and lots of obscure songs. I think my favorite is “Once In Royal David’s City” because it is the first song sung at my church’s carol service. When I hear it, it means Christmas has really begun. I guess I would have to say “Silver Bells.” I have an old memory of listening to that on promotional record from Firestone (my Dad sold their brand of tires). We had several years worth of those records and they were much loved and abused. Silent night, would have to be one of my favorite holiday songs. My favorite Christmas song is Silent Night. To me it captures the peace and hope that was born on that first Christmas day. My favorite is “Oh Holy Night”. The “Fall on your knees” part gives me chills everytime. That is such a hard question for me because I love love love Christmas music!! I put it on the day after Thanksgiving and that is all we listen to till Christmas. I love Away in a Manger and Silent Night particularly. It is the story of what the true meaning of Christmas is. But I also enjoy the fun stuff- like Winter Wonderland and Sleigh Bells. My favorite is Silent Night. My family & I always go to midnight services on Christmas Eve, and the very last hymm we sing at midnight is Silent Night. All of the lights are off in the sanctuary and everyone is holding lighted candles while we are singing. It is a very fitting way to end that very special night. With out a doubt- Silent Night. It reminds me of Midnight mass on Christmas Eve. It was always so beautiful! The lights in the church would be turned down and the Christmas lights and candles would be the light for mass. Oh WOW! I can feel the warmth and hear the music, what wonderful memories. Thank you for a wonderful release! I just adore Once in Royal David’s City …. the melody is gorgeous and I love singing the alto part I learned in choir when I was a teenager … totally gets me in the spirit! “Oh Little Town of Bethlehem” is a favorite because I love to watch the young children singing it during a Christmas program. Usually on Christmas Eve at midnight mass the choir sings this song using hand bells. It just warms my heart and gives truth to the real meaning of Christmas. I love the classic Silent Night, athough every Christmas Carol is a favorite. I love Carol of the Bells. I used to play the bells in church and I love to hear this song as a reminder of my bell playing days! Winter wonderland. It always takes me back to the glistening fresh snow of childhood. I live in the desert now! I love “Silent Night” because it reminds me of my childhood, caroling in the neighborhood, and singing at church and the Christmas Eve candlelight services. It also reminds me of those quiet snowflake evenings by the fire. I love Christmas and I love singing all carols! The Twelve Days of Christmas because it is so festive and allows so many people to get involved in singing their hearts out. Puts all involved truly in a holiday spirit. For me it Silent night, it reminds me of my big family christmas celebrations before I moved to another country. Here comes Santa Clause and Rudolph the Red Nosed Reindeer, they just make me feel like a kid again!! I love O Holy Night. It reminds me of the reason we celebrate. It is simply a beautiful song!I’ve very moving. I love the release–as usual too many things to choose from!!!! I love Jingle Bells. My parents have a sign that hangs by their front door. You push the button and it plays Jingle Bells. I love all Christmas music, but my very favorite song is “Mary did you know” The first time I heard it was when our son and his new wife sang it in church. The love they put into that song came right from their heart. It made me truly know what it is to be blessed. I really like “In the bleak midwinter” for the last verse – what can I give him, poor as I am?…. give my heart. This sums Christmas up for me! I think my favorite holiday song is Faith Hill’s “A Baby Changes Everything.” It’s so moving and lovely that I can’t help but sing it every season! I guess if I had to choose I would have to say ‘Silent Night.’ The song explains the whole reason for the season. 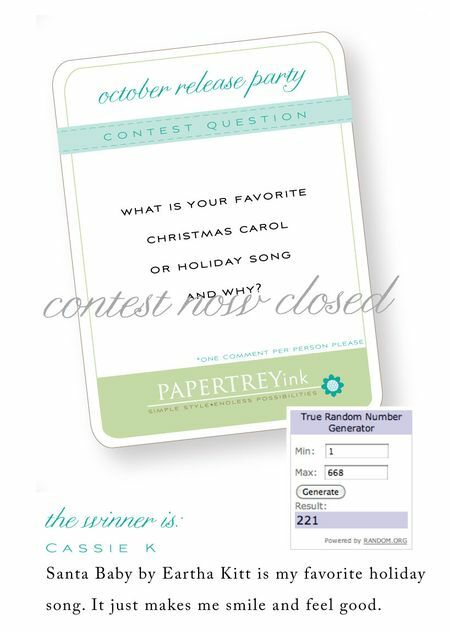 That’s a tough one…for Christmas carol I’d have to say Silent Night…it brings tears to my eyes every time I hear it…for holiday song, I’d have to say White Christmas, sung by Bing Crosby…it always puts me in the Christmas spirit. How can you choose one favorite? I love O little town of Bethlehem, Oh come all ye faithful, Silent Night, and Joy to the World. If I have to choose one I will go with O Holy Night because the words are so beautiful. “Oh Holy Night,” is my favorite song because it tells such a powerful story of Jesus’ birth and how we can be redeemed through him. I get goosebumps every time I hear this song. Away in a Manger has always been a fav since I was little. I have fond memories of singing this as a child! I love “Oh Holy Night”, as it reminds us all of the reason we celebrate Christmas. love love love silent night. all remakes, versions etc. its the quintessential song for christmas and the meaning of the season. O Holy Night gives me chills every time. My favorite is O Holy Night. It was a favorite of my grandfather and he always loved to sing it. It was sung at his funeral, even though it was summer. The first time I hear it during the season, I always cry, thinking of him. Mary Did you Know, because it is so meaningful and really tells the whole story in such a special way. What a tough question! I LOVE so many carols. They are such a part of the holiday. O Holy Night would be at the top of my list. I love that song! It is so beautiful and very hard to sing well! I am so gratful for most all of the beautiful carols we have to enrichen the holidays! Hark the Herald Angels Sing – I remember singing this when I was a child in our church choir and singing the Gloria chorus as loudly as I could. Everytime I hear this it takes me back to that little Quaker Church! Hard to choose, but Silent Night is definitely in the top!! And Frosty the Snowman is just plain fun!! Jingle Bells! I remember as a little girl Christmas caroling with the church and that was totally my most favorite song to sing. It’s so cheerful, and I loved ringing the bells while singing that song. Sweet memories! I love “Mary did you know” by Mark Lowry. Was able to see/hear him sing it in person and love it even more. The words are so powerful. Jingle Bells. I grew up listening to my Mom’s Barbara Streisand Christmas Album and I always loved that song! Aretha Franklin singing “Joy to the World” Such a high energy rendition – the energy is contagious! dashing through the snow…such a classic, yet fun song to sing while caroling! 🙂 i just love christmas time…thinking about it puts me in such a good mood! Our Christmas Eve service always begins with “Once in Royal David’s City.” First a group of children sing a verse without accompaniment, the our chancel choir sings two verses with the kids, and finally the whole congregation with organ. It gives me goose bumps every year, and has become my favorite carol. My favorite Christmas carol is Angels we have heard on high. I think I just like the tempo. My favorite radio holiday song is Chritmas Shoes and my favorite fun Christmas song is Santa Baby – the kellie pickler version. That is a hard question…I love so many. I am going to say Joy To The World. I love the Words. Merry Christmas! Mine has to be Winter Wonderland because its so up lifting and fast and fun! White Christmas would have to be my favorite song, but I do love them all. I love all the holiday songs, but my favorite has to be the TranSiberian Orchestra “A Christmas Story” cd. The music and the story are both amazing. I highly recommend seeing them in concert too. I’ve gone for the last 8 years and love every minute of it. My favorite Christmas song is O Holy Night. For my family, the song says it all – the reason we celebrate Christmas. For me, it’s Nat King Cole and the Christmas Song. Nobody can roast those chestnuts over an open fire like Nat King Cole! Beautiful and timeless. My favorite is “Stop the Calvary”. It is just one of those songs that gets you boppin’ around and just in the spirit. I love…too many! I love “O Holy Night”; because it’s so beautiful and it’s my father’s fave. I love “Silent Night” because I have soooo many memories of singing it in Church every year and it’s such a lovely traditional carol, especially when it’s sung in different many languages! And I love “Carol of the Bells”; love the blend of voices with the pipe organ! My favorite holiday song is Rudolph the red nosed reindeer. I can remember all the words and everyone will join in when I start. Win win all around. Thanks for asking. It’s beginning to look a lot like Christmas……..puts you right in the Christmas spirit. I love “Have Yourself a Merry Little Christmas” – it just reminds me of when we would have Christmas music playing while decorating the tree as kids. Such a great tune! I love “Rudolph The Red Nosed Reindeer”, we sing this song every year at my house. Loudly and very off key! My favorite song has always been Carol of the bells. I do not have much of a reason other than it sounds so Heavenly. I love all Christmas music.BUt Carol of the bells is just my favorite. I have it for my ring tone after thanksgiving! Away in a Manger is my favorite carol, and White Christmas is my favorite song. I have strong memories of singing Away in a Manger in church as a child, and it reminds me of my grandparents. White Christmas is my favorite song because it is also one of my favorite movies and it just puts me in the Christmas spirit. My favorite is the Christmas Song from Nat King Cole. It reminds me of my mother and Chritsmas memories from my childhood. I LOVE “O Holy Night” -it just moves me and gives me chills every time I hear it!! Oh gosh, there are so many Christmas carols that I love! I think my favorite is Oh Holy Night because the words are beautiful and I love singing it. Well since Christmas songs are about the only songs I can sing by heart there are a lot that are my favorite. If I had to pick those I would go with Rudolph the Red Nosed Reindeer. I LOVED that movie growing up and every time I hear the song I think of the movie which was a huge event each Christmas at our house. My favorite is Angels we have heard on High. Love to sing along with this song. It always reminds me of why we are celebrating the season. My favorite is “O Holy Night”. I love the part that says, “Fall on you knees…Oh hear the angel’s voices…” This makes me weep every year! I can just imagine all the visitors who came to see baby Jesus and how they must have been in such awe. My favorite song is Winter Wonderland. I love it because it reminds me of a snowy day. Rocking Around the Christmas Tree – It always brings me back to my childhood and singing with my sisters using wooden spoons as our microphones. Elvis Presley Blue Christmas would be a close second. My Mom loved his music and would play his holiday album over and over! Hmm, there so many good ones to choose from! I’d say my favorite one to hum along to is probably “Silver Bells,” the version by Meaghan Smith… I listen to it every few weeks now that it’s the middle of fall semester! Thanks for sharing! A Mad Russian’s Christmas by Trans-Siberian orchestra. My husband surprised me with an early Christmas gift a few years ago and took me to their concert. It was awesome! Awww—-little drummer boy makes my heart sing 🙂 I just love that he could bring a gift so unique to Baby Jesus. White Christmas will always be my favorite! We spent several years in the south and always traveled home to Michigan to celebrate with family friends and most often….SNOW! I like Little Drummer Boy because it really speaks to the meaning of Christmas for me… Jesus is here for all of us! Thanks! My favorite Christmas song is “Do you hear what I hear”. It was a song I sang in a Christmas program when I was little. It has always just stuck as a favorite! I love the song O holy Night. It has always epitomized Christmas for me. I love all the songs Andy Williams performs at Christmas, but my favorite song has to be “The Little Drummer Boy”. I LOVE the traditional Christmas songs! Wow that’s a toughie….I’ll have to say Rudolph the Red Nosed Reindeer. Its a lot of fun singing it with a group and adding all the background lyrics! My favorite Christmas song is “Frosty the Snowman” because when I was younger we use to watch that cartoon and it reminds me of my mom and being young. I just love it I normally am humming it from Oct – Christmas. I think it drives hubby nuts..
My favorite holiday song is Jingle Bells! I love singing along… and its catchy! My favorite carol is Silent Night because the song is basically the story of the night Jesus was born. It has such a soothing melody too. I love Winter Wonderland. It reminds me of snow and I can’t imagine Christmas without snow. 🙂 Good thing I live in Michigan. My favorite is The Christmas Song – just beautiful! I love “baby it’s cold outside”; it’s a timeless classic from Etta James, Frank Sinatra to the new Glee version with Kurt and Blaine. I smile everytime I hear it and think of snow falling on a dark winter night. It’s hard to pick one favorite, but I guess I’d have to say Oh Little Town of Bethlehem is my favorite traditional Christmas carol. It’s the first song I remember singing at our church’s Christmas Eve candlelight service – my favorite service of the year and one of the memorable Christmas things each year for our family. O Holy Night is my favorite. It brings back so many memories of Christmas days for years!!! Christmas carols are about the only thing played at our house the month of Dec. My favorite–Silent Night. It brings back childhood memories of Christmas Eve service at church. It would be the last carol sung before we all left to await Christmas Day! Now I use it as a lullaby for my kiddos when they are needing a little help going to sleep. I really love lots of Christmas carols, but a family classic is Grandma Got Ran Over By a Reindeer! There are so many – but probably a song called “Christ Child’s Lullaby” sung by Kathy Mattea. It’s an arrangement of a traditional celtic folk song from the Hebrides Islands. It’s beautiful and lilting and the words are fabulous. Hmmmm…..Holly Jolly Christmas because I feel like a kid again when I hear it! Joy to the World is my favorite. There is something about the word “joy” that I find elating. Surely what our Lord wants us all to feel? Christmas Waltz by the Brecker Brothers. I just love this arrangement from the Jazz To The World CD. Come On Ring Those Bells is one of my favorites. We have been singing it at the Christmas Eve service ever since I was younger. It’s starts with the Sunday School Children & then the rest of the church joins in. It’s so fun to hear the young kids when they get to the chorus. It just puts a smile on everyones face. Not a whole lot more beautiful than O Holy Night!! Looks like a FANTASTIC release! My favorite is “An Old Fashioned Christmas” by the Carpenters. I have so many Christmas memories listening to this on my parents 8track player, cassette, and then on CD. It is a family favorite and we all still listen to the Carpenters at Christmas time. Carol of the Bells is my all time favorite Christmas song. It is just so pretty. Thanks for the chance to win! My favorite carol has always been “God Rest Ye Merry Gentlemen.” I like the minor key and the serious joy the words describe. Joy to the World. It captures so much of what I love about Christmas! I love Silver Bells because you don’t get to hear it as often as other Christmas songs, and it reminds me of my first childhood memories of Christmas. O Holy Night is my favorite for it’s message. They both bring such fond memories. I love all Christmas carols but I’d have to say that Silent Night is my favorite! I can’t wait for Christmas!!! I love Feliz Navidad. It is also my youngest’s favorite song and we can really belt it out every Christmas. Silent Night in Spanish. I love the clear simple,beautiful melody. In Spanish is truly warms my heart. Mine is “Little Drummer Boy” because it not only reminds me of my childhood, but of all little children on Christmas and especially Baby Jesus. Christmas is all about the love in our hearts. I’m SO excited about this release!! Away in the Mnger always reminds me of when my boys were little and in our church’s Christmas program. I can still see them all dressed up in robes and singing their hearts out!! I love all Christmas music, but the one that stands out as my favorite is “Mary Did You Know”, it has such deep meaning, and reflects the true sentiment of the Christmas season. Thanks for always providing us with a question to stir up our memories. Without a doubt “O Holy Night”. Brings tears to my eyes every time, and reminds me what it is we’re celebrating at Christmas. Tough question! I love so many Christmas songs. One that comes to mind, though, is “What Child is This?” It is one of the first Christmas songs I learned to play on the piano when I was a child and my husband also has a special arrangement he’s written on the guitar. I love the words and it is one that we play more than just at Christmas time. Oh goodness, I love so many of them-especially anything that Harry Connick jr sings. My favorite is probably O Holy Night but my kids are yelling in the background jingle bells. Because I can’t resist hearing a good chorus sing it, it has to be the Hallelujah Chorus. There is something about the harmony of all the voices singing it for all they are worth but most of all the message. There are also the memories of singing it in Choirs myself. Silent Night – especially when played on guitars. The Manneheim Steamroller rendition is especially moving and I can almost feel the love, peace, and joy that was in the air on that first Christmas. My favorites are the ones I sang with my girls…We Wish You a Merry Christmas, Jingle Bells, Rudolph the Red-nosed Reindeer etc. As they get older and we sing less, I remember how much fun we had…Christmas shows at school, making ornaments, baking cookies…wonderful memories. Hands down it’s “I want a Hippopotamus for Christmas”! I love that song. I always makes me laugh and smile. It would not be Christmas without it. That’s an easy one, being a Mexican living outside of Mexico, this time of the year is all about the “villancicos” for me, and my favorite one is the theme for “Las Posadas” it reminds me of my childhood in Mexico and that it is all about the birth of Christ! I love Silent Night, its just such a pretty song. I love the hearing it on Christmas Eve. My favorite song is “White Christmas.” I always liked it as a kid but grew to love it after I saw the movie as an adult. My favorite is “What Child Is This”. I love the melody of Greensleeves. It is such a moving piece. “Have Yourself a Merry Little Christmas” is my favorite! SO hard to choose!!! I think of all time it’s The Christmas Song (Chestnuts Roasting) by Nat King Cole. That’s true Christmas to me. But I love so many, especially when sung by old timers… Dean Martin, Nat, Fraink Sinatra etc… I start listening to them now!! Hearing the Peanuts gang sweetly sing “Hark the Herald Angels Sing” reminds me of Christmas as a kid! Love Linus telling the Christmas story! That’s what Christmas is all about, Charlie Brown! “What Child is This” has been my favorite Christmas Carol. It was one of the first songs that our Sunday School class memorized for Christmas eve candlelight services. My favorite Christmas carol is Silver Bells. I remember my father singing it to us when we were little and he had such a smooth, Tony Bennett voice. No one could sing it like my Dad. “O Little Town of Bethlehem” has been my favorite for years. I love the simple scene the words paint and the quiet calmness of the tune. My favorite holiday song is “Up on the Roof Top” – also known to me as the “click, click” song. I remember my brother and I singing along while laughing and smiling about the lyrics. Although I am now 40 years old, my parents still tease me about singing this song as a child – all in good fun, of course! Winter Wonderland is my favorite! Reminds me of spending Christmas at my grandparent’s house when I was a kid. It would have to be “Silent Night”! There is something so serene about the song that just leaves me feeling blessed! one of my most favorite christmas carols is “angels we have heard on high”. when i was in the choir in junior high we sang it for a christmas concert and i just fell in love with it then. My favorite Christmas carol would be “O holy night” , it is so beautiful and speaks of the true meaning of Christmas. “O Holy Night” is by far my favorite Christmas carol and it doesn’t really matter who sings it!! It’s just a beautiful song that always makes it feel like the holidays are upon us!! Silent Night is my favorite – I love the story behind its creation and find it simply beautiful. Winter Wonderland – I love the melody. O come, O Come Emmanuel. I love the minor key this song is written in and it embodies the spirit and reason for celebrating Christ’s birth. I’ll be listening to this song while making my Christmas cards this year! I love O Holy Night and Silent Night. It is so heart warming to hear them sung on Christmas Eve at church. I love Jingle Bells. When I was young my brother and I used to make tapes of us singing along with Mitch Miller and send the tapes to my grandma who lived far away. We loved doing that! I’ve been listening to Christmas Carols all day trying to get in the mood! Right now I’m lovin’ Alice Smith’s rendition of ‘Silver Bells’ from the Hotel Cafe presents WinterSongs … ah, so pretty! “O Holy Night” is my favorite carol because it is so beautiful and evokes what was actually happening that special night so long ago. “Silver Bells” is my favorite contemporary holiday song and it always makes me smile in anticipation of Christmas day. There are so many wonderful Christmas songs to choose from, but I guess “Joy to the World” would be my favorite. I remember my grandmother singing this to me with my grandfather accompanying her on his guitar when I was a little girl. O Holy Night. There is something so prayerful, maybe the simplicity of the imagery–the awe of that star! Little Drummer Boy. It was the first Christmas song I learned in school. We sang it for our kindergarten Christmas program. I hate to say how many years ago that was (48!). I remember being so proud that I knew most of the words. It has always had a special place in my heart. There are several I like! Really like Josh Groban’s Believe it’s probably my current fave. “White Christmas” because I love that movie and really like when the doors to the barn open and the snow is starting. I’d like to go to that place for Christmas. I love Oh Holy Night. It hits that crescendo of “Fall on your knees…” and my heart swells everytime. Terrific release. Thanks so much for the chance to win it. Santa Baby by Eartha Kitt is my favorite holiday song. It just makes me smile and feel good. I absolutely love “Silent Night”. It is so serene and calm and the first carol I play when I get the Christmas music out. My favorite is “White Christmas since I have to watch the movie at least twice during the season. I love “Silent Night”… my all time favorite. The Christmas Song though I’m not sure why its called that….Its the one that starts ‘Chestnuts Roasting on an open fire’….I have fond memories of my parents playing Nat King Cole’s version so many times when I was a child. Because of the ages that my kids are at our favorite Christmas tune is “Santa Clause is coming to town”. The kids love singing that song and they sound so cute when they do. Looking forward to ordering some stamps. Thanks for the chance at winning such great product!! Rockin’ Around the Christmas Tree by the Partridge Family (seriously). My brother loved it and played it all the time when we were little. I love the song “Mary Did You Know”. It brings chills to me just thinking about what it must have been like for Mary at the time of her baby’s birth and throughout the rest of his life. Little Drummer Boy – there’s just something about this song that just resonates in my soul. Mine is “Hark The Herald Angels Sing.” I love it in any form, sung with the congregration at church, or singing along with Amy Grant. It never fails to give me chills. My favorite Christmas song is “What Child is this”. Whenever I hear it, it really makes me reflect on the reason we are celebrating the season of Christmas. It’s a beautiful song and still gives me goosebumps when I hear it. My favorite song is the Christmas Song. Chestnuts rOasting on an open fire! Such fun !! My favorite holiday song is one that won’t be familiar to anyone unless they are French, it’s called “Petit Papa Noel”. It reminds me of us growing up in France and all the wonderful memories of what a white Christmas looks like! Joy to the World because that was one one the first Christmas songs my grandmother taught me to play on the piano. “Oh Holy Night” is, to me, the most moving of the Christmas songs and I just love it! It’s so grand and true and says everything about what Christmas is all about. I just love Greensleaves. It is just such a beautiful song and it takes me back to when I sang in the church choir as a young girl. We sang it every year. Its a toss up between Jingle Bell Rock, because it was a choir staple growing up. And White Christmas…sung by Bing Crosby. Love the lyrics, the music…just puts me in that vintage Christmas kind of mood. I have two. “Oh Come all Ye Faithful” and “What Child is This”. I like the first because it is how we always end our Christmas Eve service and there is something about a thousand people singing that to candle light that just warms my heart. The latter has one of my most favorite melodies of all time. Both are very special to me. It has to be Jingle Bells as it is the very first Christmas song I learned in school. It is pretty hard to pick only one Christmas carol, but I will go with “O Holy Night.” My grandmother gave me her old sheet music of the song when I was younger, and I love singing it every year. She entered into glory this past June, and so now, for me, the song will now be a part of her legacy of music to me and an ongoing testimony to her love of our Savior. O Holy Night is my favorite whether sung or instrumental. Ever since I heard it played on a bugle there has really been no other way to hear it for me. It was the most beautiful, haunting rendition I’ve ever heard. There are a lot of them that I like,just depends on who is singing it. To choose one would be “Mary Did You Know”. Oh Holy Night is my fave traditional song I think because it makes me feel the awe and deep meaning of the Saviors birth. We Need a Little Christmas is my fave non traditional…it is all the anticipation and joy that I feel for Christmas wrapped into a zippy little tune. Since I start counting down the days to Christmas the day after Christmas and listen to Christmas music starting in June, it just sums it all up for me. Thanks for another month of fun!!! I love silent night it is one of my favorite Christmas carols. I have so many favorites and I know my pick is going to be an odd one, but I LOVE Mariah Carey’s “All I Want for Christmas is You”….it just really gets me in the mood and gets me excited….something about that beat…lol But I do have so many others. Can’t believe it is almost that time! Mine is a little untraditional, but one of my favorites is Grandma Got Run Over by a Reindeer. Growing up we use always play it for my grandma at our Christmas Eve family gathering. Jingle Bells. It reminds me of being in grade school singing and performing for our Christmas program for our parents. Silent night – it was one of the first christmas songs I learnt to play on the piano, and is such a classic song, that sounds beautiful in any language. Sleigh Ride is my most favorite song. I just love it and picture myself on that snowy ride every time I hear the song. My favorite song has to “Jingle Bells” because it reminds me of my first grade school music concert when I was in Kindergarten. It has to be Silent Night because it is about the true meaning of Christmas. Definitely “Joy to the World” – such an outburst of celebration and excitement! I love the idea of ‘heaven and nature’ singing together to express the wonder of a new birth. I love “O Holy Night”, it’s one of the most beautifully written carols I’ve ever heard! It brings me such peace and comfort during such a crazy time of the year. My favorite Christmas carol is “Have Yourself a Merry Little Christmas” because of the line “Through the years we all will be together, if the fates allow.” It really makes me think of all the happy times we’ve had together as a family over the years and makes me pause to remember all of the loved ones we’ve lost, but who remain with us in spirit. This song makes me forget all my troubles and really remember to celebrate the spirit of the season. Mary’s Boy Child – sung to the calypso beat. So festive, yet it’s what Christmas is all about. How can I pick one! I love O Holy Night, Oh Little Town of Bethlehem, Silver Bells, Joy to the World–I like all the traditional carols because it reminds me of Christmas when I was little. I love Santa Claus is coming to town. When I was 13, I had to do a dance in a parade for over an hour to that song. It was a lot of fun, and always brings back great memories. Silent night, because it’s so pretty and peaceful. It reminds me of singing in church choirs as a little girl !! Thanks as always for the chance to win ! My favorite has always been “Silent Night”. I always am humming it around the house between Thanksgiving and Christmas. it would have to be “winter wonderland” because i like the words & the tune is one that i can’t mess up too bad. thanks. It’s hard to narrow it down to just one, but I’m going to pick Silent Night, because it’s one of the first Christmas carols I learned as a child, and I love the story behind the origin of this song. I like “Jingle Bells” because it makes me feel happy, it’s upbeat and it’s a good family song. Love “O Holy Night”! When the church choir sings this carol at Mass, I am reminded of the true meaning of this beautiful season. Tears always well up each and every time I hear it. I always liked What Child is This? It reminds me of singing this in church with my family. My favorite is “Let it Snow”…..I just love the idea of being in the house in front of a roaring fire! Mary, Did You Know? sung by Natalie Cole. It makes me sing along. “Away In A Manger” – I love the words but also because when I told my Sunday School preschoolers to sing it so the congregation could hear them they certainly obeyed my request – you could probably hear it a mile down the road they were so loud. It is ‘O Holy Night’ hands down. Every year our church choir performed a Christmas contata and that song would bring me to tears. I always have special memories when I hear it. My favorite carol is “Silent Night”, especially when sung during Christmas Eve Service. There’s a hush in the church and the night seems so holy and special. O Come All Ye Faithful was always one of my favourites. I just love carols so much, it’s one of the most enjoyable things for me around that time of the year!! Walking in a Winter Wonderland, just love it. Remember my Mom playing it on the piano as a child. We also had a music box that was only put out at Christmas time that played this song. I love Frosty The Snowman as it brings back the excitement of the holiday season and wonderful childhood memories of Christmas past. Little Drummer Boy~ the whole story it tells just really is like my life. I may not be able to give expensive gifts, but I give my time and my talents to others. It’s a toss up between O Holy Night and Mary Did You Know? My all-time favorite is the classic “Silent Night.” I grew up in a small town in the Midwest and I remember as a little girl going caroling. We always sang Silent Night! “O Holy Night” is my all-time favorite holiday song. I always enjoyed it, but once I heard it sung live, and since then, it’s been my favorite Christmas song. I’ve always thought Silent Night was one of the most beautiful songs but I also like Natalie Merchant’s version of Children Go Where I Send Thee on the CD A Very Special Christmas 3. Thanks for the opportunity to win! O Holy Night…it’s just gorgeous! And Sleigh Ride…it’s just so fun and festive!!! White Christmas. Every year me and my mom watch the movie together, and everytime i hear it on the radio it makes me think of those times together! “We Wish You A Merry Christmas” is such a fun and happy song, especially singing it with the kids. Definitely the “Little Drummer Boy”! Rump pa pa pum…. “Oh Holy Night” I just like the words and the music. Jingle Bells sung by Bing Crosby. When I was in college, I did this little dance kicking my legs that made my roomates roll on the floor laughing. I love “The Little Drummer Boy” and love the claymation Christmas special that was on every yea as a kid. O Holy Night, I have never heard this played or sung when it did not draw me in. I long for the day I can play it well on the violin, I mean really well! My husband (guitar) and I play (violin) while collecting for food pantry during the Christmas season and even though O Holy Night is my favorite…we really like playing Jingle Bells because every little kid will stop and sing! Now that is joy! I love Winter Wonderland, probably because I grew up in south Louisiana, where we never had a Winter Wonderland! It makes me feel very much in the Christmas Spirit! There are so many that I really like so I’m going to go with Silent Night. No specific reason why. I love Christmas carols up until about Dec 1st because the stores have over played them and worn them out by then. Hark the Herald Angels Sing! It reminds of Chistmas with my family because we always sang it at midnight mass Christmas Eve together. O Holy Night is my favorite. It’s such a strong, moving song, it almost brings me to tears when I hear it. I am also going to say Little Drummer Boy but SPECIFICALLY the version where David Bowie sings and harmonizes along with a taped version of Bing Crosby singing the beloved carol! It gives me goose bumps just thinking about it and everytime I see it….I cry! You really must google it and watch it! Away in the Manger has always been my favorite Christmas carol. I can remember singing it in kindergarten. Winter Wonderland. It has such a fun tune and just conveys everything winter to me. Little Drummer Boy is a lovely and fun song. My church choir sings it every year and it puts great joy into my heart when I hear the song. Silent Night because of memories of singing it together with my family gathered around the organ in our livingroom. Carol of the Bells. Every time I hear it I get the chills. It is amazing. I love “Silver Bells”…especially when i hear Doris Day sing! Something about the hustle and bustle of Christmas always gets me in the spirit for Christmas…what a coincidence, Papertrey also has been getting me in the holiday spirit! O Holy Night! Itis just the best song ever for Christmas. Away in a Manger. It is the first one I learned to play on the piano when my grandma was teaching me. I love anything by John Rutter. Candlelight Carol is definitely a favorite. The rich choral harmonies are exquisite. My favorite Christmas Carol is, Once in Royal Davids City.It reminds me of when I was in school, we always sang Christmas Carols during our Christmas assembly. It’s a beautiful song! O Holy Night is my favorite Christmas song of all time. It makes me stop and remember the true reason we celebrate Christmas. Thanks for the chance to win. Joy to the World!! Because heaven and nature sings the birth of a King! Feliz Navidad! It is just so much fun singing in both English and Spanish. Every time I hear it I can’t help but sing along. My favourite carol is “Oh Holy Night”. I can sometimes be moved to tears if this is well sung. Great release as usual. Oh, sooo many! I do always enjoy It’s beginning to look a lot like christmas! That always pops up in my head, when I see all the decorations showing up, with the first snow and when you see lights in the evening! Love it! But from pop songs, I love Last christmas as well!! I love What Child is This because it has a beautiful melody and meaningful lyrics. Thanks for such a fantaby release. I love the traditional carols. Joy to the World is my favourite, it’s so fun when we belt it out all together at church on Christmas Eve. I love Christmas carols. I love them all from Silent Night to Frosty to Grandma Got Ran Over By A Reindeer. There’s something special about the hymns and songs that grace this “most wonderful time of the year”. We Need A Little Christmas is by far my favorite christmas song. I always think of my brother, who is far from home at work, and the way he used to sing it with the choir at school (english classes). A beautiful broadway song, turned into one of my favorite songs ever. I love “White Christmas”– it’s the first holiday song we listen to every year as we’re decorating the tree– when I hear it, I know that the Christmas season has officially begun! “All I Want for Christmas is You” by Vince Vance and the Valiants. The power of her voice and the soulful beat of the music makes me want to dance and sing every time I hear it. There are so many beautiful Christmas songs but if I had to pick one I would go with “Oh Holy Night” because it reminds me of the true meaning of Christmas. My favorite Christmas song is Oh Holy Night because it shows what Christmas is truly about. Also it is such a powerful song that requires heart and soul to sing. Star of the East is my favorite. I sang this carol “solo” when I was in the 4th grade in school,(1948). And it has always been dear to me, all of these years. jingle bells all the way!! That holiday song always puts everyone in a good mood and in the christmas spirit!! I’m not entirely sure why but I really like “O Holy Night”. When sung by a group, it’s beautiful and majestic. I have the fondest memory of “Have Yourself a Merry Little Christmas” because it was the first song I ever danced with a boy to. I was really shy and not very good around boys, but a very nice friend of mine asked me to dance with him to this Christmas carol and it has been one of my favorites now for many, many years! Oh Holy Night is the most beautiful Christmas song I have ever heard. I love Christmas, and this release is what makes creating for Christmas so worth it! A song called Indiana Christmas by Straight No Chaser. It is a lovely song and something about it just moves me. I listen to it constantly. Straight No Chaser is an a cappella group and they have the most amazing Christmas cd’s. O Holy Night has always been one of my favorites because it is absolutely beautiful and moving. I’m already looking forward to holiday music season, which starts right after Thanksgiving in our house! My favorite Christmas song is ‘Do you hear what I hear?’ I love it so much I find myself singing it in the summertime. The opening line, “said the night wind to the little lamb …” I often think of animals in the pasture being spoken to by the winds. Such a beautiful song. Hmmm…what a difficult question. I love so many of the playful Christmas songs from the 1940s and 1950s, but the song that I remember most from my childhood is Silent Night. The church I went to as a child would always include Silent Night in the midnight service. It was so beautiful with the candles flickering and the whole congregation singing in unison. A happy memory to this day. Definitely White Christmas! Just always makes me feel warm inside. Love the Bing Crosby version, his voice is just so incredibly smooth! My favorite Christmas song is “I’ll Be Home for Christmas”. I was blessed to have my husband home every Christmas for the past 19 years…which is a MIRACLE for a military family. I remember that song was running through my head when I thought he would miss our first child’s First Christmas. He came home that Christmas Eve. It still brings tears to my eyes. Every song from “The Forgotten Carols.” I’ve been to the musical, have the CD, the book, etc. It is absolutely amazing. If I have to narrow it down to one favorite, it would be “Let Him In.” Everyone should have this CD!!! Away In A Manger is my favorite Christmas carol. The words remind me to practice gratitude even more. I’ve enjoyed all the inspiration this week, as always! It is definitely “Carol of the Bells.” I have loved that song since I was a kid. I was always in choir in school and it was one of the songs we did every year during the holidays. I loved how the song was sung in rounds. It was like “Row Row Row Your Boat, ” much prettier. I love the song Mary did you know? It is a lesser known Christmas song and it is just so beautiful. Silent Night has got to be my favorite — I think it was the first Christmas song my kids learned to sing. What memories!! Marshmallow Christmas. Bing always makes me think of Christmas in a more simpler time. part of me wishes I would have grown up in the generation before me. We move at such a rushed crazy pace all year but it is Christmas time that I wish most that we could slow it all down and cherish every moment. My girls even love Bing!! For me its ‘Silent Night’ I was brought up in Germany and learnt it in its original form when I was a child ‘Stille Nacht’. Brings back many happy memories. All of the Messiah. We put it on every year while we are decorating the tree…..family tradition and really sets the tone for the Holidays. My favorite Christmas song is “Angels We Have Heard On High” which my high school choir walked into the gym singing in the dark holding candles for our annual Christmas program. I did that for 3 years & I’ve never forgotten it even though it’s now been over 40 years ago. “Away In A Manger” is one of my favorite songs. The words are so meaningful to me and talks about our Lord and SAvior as King. I absolutely love Silent Night by Mannheim Steamroller. Our youngest son took us to one of their concerts and that is a treasured memory. White Christmas because it reminds me of my parents playing it around the holiday season on the old record player console. I have many favorites… and many Christmas CD’s to prove it!!! lol But I think “Winter Wonderland” is most memorable because my mom & I would sing this one together while doing dishes in December. That’s a good one! There’s a version by Bare Naked Ladies and Sarah McLauchlin (sp?) It’s fantastic! Silent Night when sung as we leave church on Christmas Eve. Silver Bells! I used to sing it with my Mom, she had a beautiful voice, I miss her everyday, but even more so around Christmas. A wonderful song with special memories attached to it. There are so many but I really love O Holy Night and I’ll be Home for Christmas. O Holy Night reminds us that we are celebrating our dear Saviour’s birth and I’ll be Home for Christmas for it’s celebration of family. Silent Night. It is so Christmas for me. Candle light service on Christmas Eve at church with family. It’s “Silent Night.” Whenever I hear it, I remember being about 5 yrs. old hearing it at midnight mass, and holding my dear mother’s hand. My favorite Christmas hymns would be Silent Night and O Holy Night. For more secular, I love the songs Trans Siberian Orchestra plays in concert. This is a fabulous release month for PTI. Thanks for the chance to win! Mary Did You Know. This song captures the reason I celebrate Christmes!! I love all christmas music, the whole season really, but I have to admit that Baby it’s Cold Outside, by FAR, is my favorite these days. I can’t decide if my favorite hymn is Angels We Have Heard on High or O Holy Night. My favorite Christmas song is White Christmas, along with the Movie. I love most Christmas hymns and songs and even though I haven’t been in years, Christmas caroling. The time will be here soon. Silent Night! That song comes to mind since it is so calming and beautiful. Thanks for a chance to win! It’s hard because they are such special songs. I love the newer “Mary, did you know?” because it really makes me think and feel. I must say it is O Holy Night…difficult to sing but oh so beautiful to listen to. It takes your breath away. Have Yourself A Merry Little Christmas has always been a favorite of mine. I remember seeing Judy Garland singing it in Meet Me In St. Louis, and it always fills me with deep emotions when I hear it. Silent Night is my favorite. The song is so peaceful. White Christmas by Bing Crosby. When Bing was 10, he moved to the town where I live(Spokane, WA) so it has some sentimental meaning, and I just really like the song especially on a cold, snowy day! Without a doubt my favorite is “Oh Holy Night”. It never fails to remind what the season is really all about and is so beautiful when sung well! My favorite is O Holy Night. It’s so beautiful and it makes me cry! Oh Holy Night, love it, love it, love it! my favorite carol is “Silent Night”. I think it describes the Christmas Season so well and yet in such beautiful words and images. Not to mention that the melody is outstanding! That’s a tough one. I love Christmas music. Emmylou Harris’ Light in the Stable is lovely. Hark the Herald Angels Sing and Oh Come Oh Come Emmanuel remind me of singing in church as a child. Winter Wonderland and Sleigh Ride, Carol of the Bells, I could go on and on. I don’t think I have a favorite really. I love them all. It’s not a traditional Christmas song… but is a favorite by Kenny Chesney “Thank God for Kids” it makes me smile!! O Holy Night brings me to tears when sang in church. For fun carols, Grandma Got Run Over By A Reindeer cracks me up each time I hear it. I like the 12 Days of Christmas because it is the only one that I learned all the words to when I was a child. But, Silent Night is the one I just love because it is the meaning for the season. I love O Holy Night, especially when it is sung by Nat King Cole. Just beautiful. I absolutely love “Little Drummer Boy”. It’s such a meaningful song. There are so many that I love. A sentimental favorite is Santa Claus is Coming to Town because it always brings back memories of my two little girls singing this song so very excited about Santa coming. I also love Its beginning to look a lot like Christmas it always helps to put me in the Christmas Spirit. My favorite is ‘Carol of the Bells’. I love the quick pace to it. The majestic feel from the rising notes. I’ll stop everything to hear it. My grandmother used to pull out the Mitch Miller Christmas album that had lyric sheets to pass out for sing-a-longs. So pretty much any of those songs are happy memories but probably a favorite would be “its beginning to look a lot like Christmas”. Oh Holy Night for sure. As a young girl I was in a Christmas program and one of the girls in my class sang this sond. It was so beautiful I will never forget it. I love Corelli’s Concerto Grosso in G minor (aka, the Christmas concerto). I used to be a cellist and loved playing the solo portion. is for everyone. No matter what color or nationality. My favorite carol is The Christmas Song. Every time I hear it I feel like snuggling with my family. I just love everything about that song. it’s gotta be jingle bells. i’m a first grade teacher, and to hear them belt it out is just too cute! There are so many beautiful songs…but I would have to say my favorite one is Mary Did You Know. It is such a touching song and is what Christmas is all about. I’mmmmm dreaming of a whiiiiite Christmas….. Because I lived in California and gosh I wanted snow so bad! 🙁 Finally moved to Idaho as an adult and get it more often than not. Christmas wishes do come true! I like the song Winter Wonderland. Its my favorite because it reminds me of a pretty snowy winter day. I love “Silent Night”. It’s the first Christmas carol that I learned when I was about six years old. I know all of the verses. I remember singing it in the car with my younger sister on the way to my Aunt’s house on Christmas Eve night. I love Silent Night. I think it’s just peaceful. I love to sing “silent night holy night” during christmas season. My church has a tradition to visit each members’ house and sing the song during the christmas eve. The song makes me feel holy and peaceful. Oh for sure it is The Little Drummer Boy! It has been my favorite since I was a little kid. It always takes me back to when I was a kid eagerly waiting for all of the relatives to arrive for our special dinner. All the kids laughing and playing! My favorite Christmas song is, without a doubt, Silent Night. At our church service on Christmas Eve, that’s the last carol sung, and it’s sung by candlelight. Everyone attending gets a candle to light and hold….such a beautiful sight with only candles glowing in the church……all the lit candles raised up to heaven in celebration of Jesus’ birth. My favorite has got to be “O Holy Night”. I always get chills as it helps me to remember the true meaning of Christmas! My favorite Christmas carol is “O Holy Night.” What a beautiful song–the true meaning of Christmas. Love the stamps and dies. Such inspiration . My favorite holiday song is White Christmas. I always loved to watch the movie as a kid, and the song reminds of the movie. I love to listen to it every year!! O Come All Ye Faithful is inexplicably moving to me. On Christmas Eve we sing this at church and always it brings tears to my eyes. What an awesome collection! Of all the ideas going through my head! I love Silent Night. Christmas is a time to reflect on that long ago night that we were given the greatest gift of all and this song gives wonder to that gift. White Christmas…..hands down! The classic version by Bing Crosby. Merry Christmas, Darling by The Carpenter’s — my mom and I practically wore this album out when I was growing up — both of us singing along. I absolutely LOVE Christmas carols and Christmas music!! I would have to say my favorite, though, is “O beautiful star of Bethlehem” simply because my fathers side of the family sang this a cappella once, and it was just amazing!! I love Santa Baby. It always makes me smile. My favorite is “Silent Night” because it so lovely. Thanks for the chance to win. My favorite Carol Song “Oh Holly Night” because it’s so peaceful and really represents what Christmas is all about. I have a lot of different versions of that song and is one of my favorite to hear while making my holiday cards. “O Holy Night”. It expresses everything that is Christmas and why we celebrate it. I get the chills every time I hear it and/or sing it with my large choral group. It also expresses the hope we all should feel for what our Lord provides for us. I love Mary Did You Know. I heard it the first time a few years ago. I even went out and found a cd with it so I could hear it when I wanted. I love all Christmas carols but my all time favorite is Winter Wonderland. Have Yourself a Merry Little Christmas…that line about “should the fates allow” always gets me. Mostly though, it reminds me to just keep things simple and happy. I love song Santa Baby! It reminds me of those old fashioned days of romance and wonderment. White Christmas, of course!!! Lots of memories associated with that song… Thanks for the chance! Tony Bennett’s “My Favorite Things” – I love that big band sound! I love Carol of the Bells. It gives me goose bumps every time I hear it. It is the most beautiful piece of Christmas music I have ever heard. up until a few years ago i would have said Silent Night. but now my all time favorite is faith hill’s A Baby Changes Everything. i can sing that song all year long (and i do). I’ve always loved O Holy Night. Oh, Holy Night is my all time favorite. 12 Days of Christmas is one of our family favorites. After presents are open we all gather around the piano and sing 12 days of Christmas with each family member chiming in on different days. We laugh so hard we can hardly sing sometime! My favorite Christmas song is “Mary have you Heard”. I first heard this song about 5 years ago by Clay Aiken and thought that it was so beautiful and really captured the meaning of Christmas. “Little Drummer Boy”…most favorite version is Harry Simeone Chorale…but I like the Bob Seger version too. I love O Holy Night. It never fails to bring tears to my eyes. It reminds me of the real reason for the Christmas holiday. My favorite is “O Holy Night” – I’ve loved that song since the first time I heard it in 5th grade when my classmate Kenny sang it solo in glee club. Every time I hear it I think of him and wonder where he is now. Blue Christmas by Elvis…Elvis’ Christmas cd is the first one we pull out every year since our daughter was little and my husband always starts singing that one first. Even at 13 that is still her favorite Christmas cd. O Holy Night is my all time favorite song, my sister use to sing it so beautifully. I always think of her when I hear it. Thanks for a Great release and all the beautiful examples made by all! Rudolph the Red Nose is a favorite of mine. So fun to sing with all the children in school. “First Light” isn’t a well-known Christmas song, but it builds from a soft, simple beginning to a grand, glorious ending! Touches my heart every time I hear it. One of my fondest memories is of my parents playing Johnny Mathis Christmas songs on the record player as we decorated for Christmas. My favorite was The Little Drummer Boy. O Holy Night is my favorite Christmas song; it instantly helps me to take a deep breath and remember the true meaning of the holiday. Wouldn’t it be fun if our PTI boxes played holiday music when we opened them this month, sort of like those musical cards? Thanks so very much for a chance to win these fantastic products. Silent Night! The words always remind me what the holiday season is all about and gives me a sense of peace. Do you hear what I hear. I just love the melody and the the warm feeling I get when I hear it. and for so many different reasons. But Grandma Got Run Over by a Reindeer will NEVER make my Christmas playlist! My favorite is Silent Night, because of the special feeling it gives to sing it at our Christmas Eve candlelight service. I think my favorite carol is “Oh Holy Night”. It’s just so pretty and moving. My favorite holiday song is probably “Please Come Home For Christmas” as that is one of the first songs my husband and I danced to. What an awesome release! Can’t pick one favorite song, I will have to say my favorite Christmas music is anything by Transiberian Orchestra! I am a child of the 80’s and love “Do They Know It’s Christmas?” It always reminds me of that time of my life. O Holy Night, The words are wonderful and the tune is magnificent. When I hear a good soprano sing this song it makes chills go up my spine and almost tie is the Hallalujah Chorus. Doesn’t this song give you goose bumps when you hear a good choir sing this? I hate when Christmas is over because all these wonderful songs are put away till the next Christmas, what a shame. I would have to say Rudolph the Red Nosed Reindeer. It takes me back to the days of elementary school (for myself and my kiddos) Christmas programs and dressing up with the construction paper antlers and the cute hand signals that go with the song. I love so many…Christmas is just my favorite time of year…I could probably listen to the songs all year long…they are so uplifting. The Christmas Song by Nat King Cole and White Christmas by Bing Crosby have always been my favorites! It will always be Silent Night for me…I have wonderful memories of being a little girl and singing it in church on Christmas eve…. My favorite song is Oh Holy Night. I remember playing it on the piano when I was much younger. It always evokes such a special feeling. I love “Oh Holy Night” because for me it sets the tone for the entire Christmas season and helps keep me focused on what this celebration is truly all about. Fabulous Release!!!! I’m so excited about this one. Okay, my favorite song is O Holy Night. It’s a beautiful song, in both lyric and musically (of which I am so not! LOL). It’s what Christmas is all about, the birth of our Lord and Savior. “Winter Wonderland” is my all time favourite. When I think of Christmas I just start humming and singing along. Happy memories of my childhood. By far the song that moves me the most during the holidays is “O, Come All Ye Faithful”. It always brings me to tears for some reason. So many favorites, but I’d probably pick “Little Drummer Boy” because it reminds me of my grandma. Oh Holy Night is a favorite too. O Holy Night is one of my favourites. It beautifully conveys the Christmas message. O Holy Night is my very favorite! It is beautiful and moving, and embodies the real meaning of Christmas! Joy to the World, a reminder of the true meaning of Christmas. “Jingle Bells” is a favorite. Love ringing the bells and singing with the kids…it’s their all time favorite as well. O Holy Night is my favorite, especially when all the verses are sung! The music is beautiful and the lyrics are such a poignant reminder of the true meaning of Christmas. I like Silent Night. The family sings every Christmas Eve and the evening always ends with Silent NIght. I love “jingle bells”! It reminds me so much of Christmas past as a kid. My favorite song is “Mary, Did you Know?”, sung by Kenny Rogers. I love how it reminds us of Christ and why He was sent. My eyes tear up every time I hear it. O Holy Night! I love the sentiment, the melody, everything about it. And I love that there are so many versions…jazzy, country, acoustic, choral, etc. I love them all! My favorite carol is Silent Night. Every year our church service concluded at midnight with everyone standing and singing Silent Night in candle light. The handbells and organ play the last verse alone, That starts Christmas day and it’s just beautiful. “Silent Night” sung by Bing Crosby. Love the words, and love his smooooooth voice. My favorite song is Mary let me hold her Baby by Michael Mclean. A beautiful song. We have to pick just one?? That’s tough….but I would pick “Silent Night”. Love the melody and how everyone sings it quietly. Christmas carol sing alongs are my favorite part of the holidays. It has got to be Sleigh Ride. I just love that up beat tempo and it is always the first song they play on our local radio station to kick off the holiday season! My favorite is Away in a Manger. I can remember being a little girl setting in church singing it. I really like Silent Night as it is very calming and reflective of the reason for the season. I Love little drummer boy because it reminds me of my older brother of when he would sing it. Angels We Have Heard on High for the sheer beauty of the season. Feliz Navidad because it just makes me happy. I love Mary Did You Know because it is about the reason for the season!! My favorite Christmas song/carol has to be Mary, Did You Know? It’s so touching and captures the true essence of the reason we celebrate this wonderful season! Carol of the Bells! It has my name in it! 😉 It is up tempo, it makes me walk away singing it, and whether it’s sung on instrumental…it is beautiful! I don’t have a favorite but Joy to the World is close to the top of my list. It expresses the reason for the season. O Holy Night is one of my favorites. It always brings chill bumps when I hear it. I love all of the Christmas hymns that I grew up singing in church. Definitely Silent Night because we sing it at church on Christmas Eve with just candlelight. “What Child is This” is my favorite Christmas carol; it is a very spiritual and moving song. Silent Night. This one always calms my mind and makes me remember why we celebrate Christmas. Glor–ooo-ooo–ooo-ria, in excelsis Deo! I always loved when we would sing this in church and the organ would stop playing and the congragation would stager the chorus. So up lifting. I always love to hear ‘Jingle Bell Rock’; it’s a fun holiday tune that I can dance to! My favorite carol is “Oh Holy Night”. This was one of my mother’s favorite songs of the holidays. It always makes me think of her. My favorite would be O Holy Night……..it’s beautiful every time I hear it. I Heard the Bells on Christmas Day, performed by Casting Crowns. It was written out of sadness by H. W. Longfellow, But it also expressed his optimism and belief in God. When the choir starts singing during the Casting Crowns song, it is so inspiring and beautiful, I can’t wait until Christmas! Silent Night–this was a favorite as we sang it before opening presents. My Grandfather, long ago, started this tradition and we carry it on still. Along with other Christmas Carols. There are so many great songs.. my favourite traditional song is “O Holy Night”… my favourite contemporary song is “The Christmas Song” by Dave Matthews. Thanks for the chance to win! The Little Drummer Boy. It’s sad and poignant. Melancholy and haunting. Love it. Jingle Bells is my favorite because my kids love to sing it! I love the ‘Little Drummer Boy’…it has such a nice meaning and chokes me up every time. I like “Do You Hear What I Hear?” – even though I am not religious at all. I just like the melody and the sound of it. My favorite song has always been jingle bells. It’s such a happy song and reminds me of being a brownie leader to my daughter’s troup many year’s ago. Those little girls loved singing this song! Sleigh Ride. I am a musician and the tapping of the sleigh bells in the percussion section is just the absolute *perfect* Christmas sound. My favorite Christmas carol is “O Holy Night”. It is such an emotional reminder of God’s great love. It also has a sentimental meaning to me: when I was a little girl, I learned to play it on the piano as a gift for my father…it is his favorite Christmas carol also. To listen to, I would say The Christmas Song sung by Nat King Cole. So homey and comforting to me! My two favorites are ‘Oh, Holy Night’this was my Husband’s grandmother’s favorite song – her sons would sing it to her every Christmas Eve and ‘Mary did you Know’- this song I listen to over and over again super loud while I am baking my Christmas cookies……….it is such a beautiful song……..
O Holy Night is my personal favorite. It embodies the spirit and meaning of Christmas. The melody is that of a lullaby and the words a testimony of the sanctity of birth not only of a baby but of a family. Therein lies the meaning = love family continuity. My favorite Christmas song is Sleigh Ride. I LOVE all of the jingle bells and percussion elements that the local symphony adds to it during their holiday concert! It’s so festive and fun!!! Silent Night is my all time favourite, especially at the Christmas eve church service when they dim the lights and everyone has a lit candle. That for me is when Christmas begins! Silent Night is my favorite Christmas carol. It makes me think of my childhood Christmases. Silent night… my mom pass away on Christmas Eve and this song reminds me of her. Jingle Bell Rock–one of my favorites!! My favorite is “White Christmas” because as a child I always looked forward to snowfall, but now it is usually the first Christmas song I sing or listen to. I love “Silent Night” its such a beautiful song, reminding us what the holiday season is all about. Its always the last song at church on Christmas, and it sits with me all day long. On a silly note, I love “Dominic the Donkey” and so do my kids. By far it has to be Silent Night. It gives such a warm feeling inside. I cry every Christmas when we sing this song at church. Actually, I love all Christmas songs. My favorite holiday song is Adam Sandler’s “Hanukkah Song”. As someone who is Jewish, I finally have a song for my holiday too! O Holy Night is my favorite. It is such a profound & moving song when done properly. Just brings chills!!!! Oh Holy Night is my favorite song because it’s about the true meaning of Christmas. Hands down, “Do you hear what I hear” to me it is Christmas! He will bring us goodness and light! The reason for the season. My favorite one is “O Holy Night” because my mother sang it in church every year. Everytime I hear it, it reminds me of her. My favorite Christmas carol is “Silent Night”. It reminds me of Christmas eve candle light service at our church when I was growing up. It was tradition to close the service with this beautiful song with the lights out and everyone’s candle burning bright to pass the light on. Oooo…this is a tough one. I have so many favorites! I listen to Christmas music all year long. But, Born on Christmas Day, sung by Peabo Bryson always makes me slow down and listen…the lyrics remind me of what Christmas is really about. It’s always been “O Holy Night” because it doesn’t shy away from the true meaning of Christmas. But, “Mary’s Boy Child” by Boney M is a close second. It’s the perfect carol to sing (and dance) too. Just hearing “O Holy Night” brings chill bumps when it is sung. I really love all of the Christmas hymns I grew up singing in church. Mary Did You Know is my favorite Christmas Song. I just love that the song is from Mary’s perspective. It really drives home to me that Jesus was all human and all God at the same time. I still get chills every time I hear it. My favorite Christmas carol is Silent Night. I remember singing it in church when I was carrying my daughter and crying because I was so happy and knowing for the first time what it felt like to be a mother. That Christmas will always have a special place in my heart! My most favorite Christmas carol is O Holy Night! I love how I connect to that song! And I couldn’t be more thrilled that it is part of the Nativity Silhouettes stamp set! Can’t wait for Christmas! “Oh Holy Night” because it is a beautiful reminder of the reason for the holiday. I love Christmas carols…. I’m dreaming of a White Christmas is a favorite….not practical in south Texas though…. It has to be Jingle Bells. I just love to hear my kids sing this every year! Music to my ears! I just love Bing Crosby and White Christmas ,as I live in Australia my chances of ever seeing one are very slim but it is a wonderful song. “Baby it’s cold outside” is my all time favorite. I love when I play it on the radio in the car and my little daughter is singing “baby its cold outside” at the top of her lungs! Joy to the world. Because Christmas is about Joy, jesus is born! My favorite holiday song is Mary Did You Know. The reason why is because our daughter in law sings it beautifully. There are so many beautiful carols, but “Angels We Have Heard on High” is one of my favorites because of the beautiful music and the joyous message. Silent Night is definitely one of my all time favorite Christmas hymns. We sing it in 4-part harmony at the end of our Christmas Eve candle light service and its one of my favorite moments every year. My other fave is Go Tell It On the Mountain (especially the Garth Brooks version) just for the joy it exudes! I love O Holy Night – it just so beautiful. My favorite holiday song is “White Christmas”, it always makes me think of the movie which is a favorite of my family. Its such a pretty song and sums up the season for me! I love Oh Holy Night. When it is sung by the right person it is just beautiful, it gives me shivers sometimes. I also pretty much love anything by the Tran Siberian Orchestra! If you haven’t heard them you need to, they are awesome! Thanks for the chance to win! My favorite Christmas song is Angels We Have Heard On High. The Glorias are so fun to sing! I also think it is a pretty song. THANKS for the chance to win and have a FABULOUS WEEKEND!! My favourite carol is ‘Once in Royal David’s City’. It is chilling when sung unaccompanied, especially in a large hall. Sleigh Ride. Because it is a song that epitomizes winter and it has the bounce of a celebration song. I’m Dreaming Of A White Christmas . . . Hearing it always takes me back to my childhood and the wonderful memories of decorating our tree in Michigan while it was quietly snowing. Everyone was so happy that Santa would be arriving during the night. The large colored lights on our tree with the tinsel sparkling looked so magical. White Christmas is my favorite! The song was sung in the movie White Christmas and it always brings back the special memory when I was young and I would watch it with my father. Definitely O Holy Night. Brings tears to my eyes every time I hear it and our worship leader at church sings it every Christmas Eve in such a heartfelt manner. Tell the true story of Christmas, and the precious gift from God to man. Mary’s Song. It’s such a poignant reminder of a young mother’s fear’s and hopes. I love I’m Dreaming of a White Christmas. I love snow at Christmas time! My favorite Christmas memory was being in the hot tub on Christmas eve in the snow! I was about 6! Most definitely “White Christmas”. Love the movie and love the song…always gets me in the spirit! Ok, seriously, it’s “I Saw Mommy Kissing Santa Clause” because it totally CRACKS my 4-yr-old up. He’ll sit and listen and look at me and just get the giggles. I love his laugh!! I love white Christmas. The lyrics is beautiful. Being grew up in tropical country, I get excited when it snows especially on Christmas day. Frosty the Snowman it reminds me of the magic of make believe as seen thru a childs eyes. Oh thank goodness for little ones. My favorite would be Mary Did You Know with a close second It Wasn’t His Child. This release has definitely put me in the mood to make cards and sing! I love love love Baby It’s Cold Outside! But and I am blushing here… I do love Kenny and Dolly’s Christmas, it’s a tradition! I’m dreaming of a White Christmas is an all time favorite! It reminds me of watching Christmas movies in black and white with my parents. My favorite holiday song is Oh Holy Night. It was the first carol that I learned in English. When I hear this song, it always makes me cry and remind me of the true meaning of Christmas. That is easy for me. “The Christmas Song” (the one that had chestnuts roasting on an open fire. The reason, it was the first song I remember learning to sing myself, and it bring back so many memories, warm fires, family. Already working on my Christmas cards. Keep up the fantastic work Papertrey! “I’ll Be Home for Christmas” is my favorite because I always think of my childhood home at that time of year. My mother went to great pains to decorate the house and have everything perfect for the holidays. I try to replicate her ideas and I love having my whole family home for the festivities. “Oh Holy Night” is my favorite. It always sends chills up my spine! I used to like playing Carol of the Bells on the piano! That’s a tough one. I’ll say Jingle Bells, but I love Silent Night as well. One is so fun and spirited, the other so touching. Looking forward to the release. Off to see how much of my wish list I can afford. Thanks for the chance to win! White Christmas is my favorite. I love the movie and love the song, Bing Crosby singing it usually starts off my season. Come on Ring those Bells,is a family favorite of ours. It is a song that is always song by the family every Christmas Eve & than the gifts can be opened. I love “Grandma Got Run Over by a Reindeer” and “Joy to the World”. The first one is fun and the second one just makes me feel like it is the Christmas season. Can’t choose one over the other, since the decision to listen to one or the other depends on my mood at the moment. As an aging baby boomer, I remember Gene Autrey’s ..Here Comes Santa Claus..right down Santa Clause Lane . I can remember my mother singing that to me as a little girl. Happy Christmas Memories. I will have to go with “Frosty The Snow Man” I just love listening to my kids singing it during Christmas. That is such a hard one! I love them all – I guess ultimately it would come down to a tie between This Baby By Steven Curtis Chapman and O Holy Night sung by either David Phelps or Josh Groban. Both songs make me want to sing and yet stop & contemplate the season – all at the same time. Honestly, whenever I hear Feliz Navidad, it really gets my toes tapping and I’m instantly in the mood for Christmas! I have such fun and happy memories around that song! Love Jingle Bells…so happy and cheerful 🙂 I also LOVE Silent Night too!! It would have to be “jingle Bells” right now. My children love singing it, so it is always a big tradition at Christmas time. My favorite is jingle bells! Love that song- makes me so happy! Love all the traditional classics! Two additional favorites are “Do You Hear What I Hear” and “Have Yourself a Merry Little Christmas! I love Silent Night (especially Sinead O’Connor’s version), it was what Christmas is about – the miracle of the birth of Jesus. I think it would have to be jingle bells the happy tune just puts a smile on my face. Even though we don;t have any snow to jingle through down under! Carol of the Bells. We always sang it for the Xmas choir concert. It’s just so beautiful and fun to sing! My favorite Christmas song is O Holy Night. I love how it tells the Christmas story. The Holly and The Ivy is my favourite song…we sang it in our church choir when we were kids and my brother had a solo! Joy to the world – my family favorite- christmas eve service. I just love hearing White Christmas… and I love hearing it when I view the movie by the same name. I just love the cutesy of it all! My favorite carol is “Far Far away on Judea’s Plains”. It was written in my hometown. The author received the words in a dream and work up and wrote this beautiful hymn. My favorite carol is Oh Holy Night. A church service at Christmas isn’t complete without it. Silent Night is my favorite Christmas song. It is such a beautiful and peaceful song. It is very calming when things get hectic during the holiday season. Awww! I loved singing carols back in school…. And miss it so very much…. 🙁 But I like THE DRUMMER BOY! I adore the tempo in it….. And the lyrics is something, that moves me….. Very simple yet strong!!! “Mary did you Know” is one of my many favorites. It actually takes you back to that time and think how she must have felt giving birth to the King. It makes me tear up everytime I hear it. It is the true meaning of Christmas. White Christmas by Bing Crosby! O Holy Night because it reminds me of Christmas Eve when I was growing up. My Mum and Dad both sang in the church choir and this was their favourite Christmas hymn. What Child Is This? Just love it. Favorite is a more contemporary song by Boney M, called Mary’s Boy Child. It was my mother’s favorite song when I was young and a remember her singing along to it when it would come on the radio. Brings back wonderful memories each time I hear it. I love O Holy Night. It just so serene and peaceful. And Ii also love Do They Know It’s Christmas Time. The message is so powerful and it reminds me all the time that are so many other that less fortunate and that Christmas is more than just about presents. It’s about caring for others. “Good King Wenceslas” is my favorite holiday song. Not only are the lyrics and melody appealing, but I fondly recall the Christmas eve when I first heard it many years ago in a historic church in rural New England. My favorite has to be ‘Twelve Days of Christmas’ ever since we sang it in a holiday assembly in elementary school. I love the counting aspect of it! My favorite Christmas song is a non traditional song – “Last Christmas” by Wham! I am a big George Michael fan. My favorite Christmas song is “Little Drummer Boy.” It’s been my favorite since as long as I can remember, I even have a music box with it. “Go Tell It on the Mountain” is a close second. My favourite is O Come O Come Emmanuel because it is associated with lots of special memories! I love Jingle Bells and Dashing through the snow! Oh, there are so many! I’d have to say Silent Night for the most favorite, though! I always loved “I saw mommy kissing Santa Claus.” My parents would sing it together- they had such beautiful voices- and then kiss each other lovingly. I always thought it was so cute that they were acting out the song… It was great to see such a loving relationship! I love “Silver Bells.” Sang this in choir in middle school, loved it then and love it still! I sing it to my baby when I run out of lullabies. Christmas songs are my favorite. Christmas cd’s are already playing in my car. My favorite is Silent Night. I love The little drummer boy the most probably. It evokes such a calm feeling in me. Silent Night because I love to sing it and you can catch me singing it all year round. I’ll be home for Christmas has to be my favorite. It just makes me smile. My favorite Holiday song is Happy Xmas (The War is Over) by Celine Dion. There is something so touching about that song that really fills my heart with feelings of the holiday season! A lovely melody and inspiring words. I used to sing it to my boys at bedtime. I love Bing Crosby and David Bowie singing “The Little Drummer Boy.” Such opposite individuals, but singing beautifully together…a great example of what the holiday season should be! for me it is the bing crosby and david bowie duet of the little drummer boy and peace on earth. it just sends shivers down my spine and has done so since i saw the television special from which it originated. I have always loved “The Christmas Song” (Chestnuts roasting on an open fire” by Andy Williams. I just enjoy the melody and I can just vision the fire burning and I have always loved Andy Williams. My favorite Christmas song is Do You Hear What I Hear. When I was in about 4th grade we sang the song for our Christmas Program and I have loved it ever since. It brings me happy memories of Christmas when I was a child. Things seemed so much simpler back then and I remember the excitement of getting a box of crayons and a coloring book in my stocking. We would go down to the pond on Christmas Day and shovel off the snow so we could ice skate, it didn’t matter if it wasn’t perfectly smooth. It is hard to say that I have one favorite but I love White Christmas. I love the movie and growing up in California I haven’t had a white Christmas and the song makes me feel like I have seen one. There are so many holiday songs that I like and one of them is A Baby Changes Everything by Faith Hill. It has meaning on so many levels, spiritual and non-spiritual. Oh for sure it has to be ……Band Aid—Do they know it’s Christmas? 1984. Can you believe it’s been that long? A little Wham, Duran Duran or Boy George anyone? Love it! I love Mary Did You Know that Kenny Rogers and Wynona Judd sing. Silent Night because each Christmas Eve as we left midnight services thus is the song we sang. We would walk home with snowflakes falling at midnight and it was indeed a Silent Night. Hark the Herald Angels Sing! It is the song that is always sung at the end of our midnight candle service at church on Christmas Eve, right when we blow out our candles. It is always so joyous and exhilarating and gives me goosebumps everytime. It is truly what Christmas is all about. Thanks for the chance to win this most generous prize! I LOVE PTI! My favorite Christmas song is the 12 days of Christmas…but the version sung by the MUPPETS!! I love that song!!! The Holly and the Ivy has been my favourite ever since I learned it for a grade school choir over 50 years ago. I look forward to hearing it every year and this year, to teaching it to my Grandson who is old enough to remember the words now..
Dreaming of a white Christmas is my fav carol! And now I’m dreaming of all the Christmas projects I can do with this release!!! It’s hard to pick just one song!! White Christmas is a true classic! And who doesn’t wish for a white Christmas? I’m fortunate to live in an area where we often have one! O Holy Night. . .it will always remind me of my grandmother. I love all the “Crooner” Holiday songs by Bing, Frank etc. and now Michael Buble! Can’t wait to hear his new Christmas CD as I make my cards to his new tunes. My favorite is Joy to the World because I just love the words and the music makes me feel so joyful! My favorite is O Holy Night. When I was in Grammar School (many years ago), I was in the church choir. It was so exciting when we were asked to sing at Midnight Mass on Christmas Eve. When I hear that song, it reminds of those simpler days. I love Winter Wonderland – it’s just such a happy Christmas song and I sing it during snow storms even after the Christmas season is over! Santa Baby has to be the cutest Christmas song ever. Have a Holly jolly Christmas… I love it cause it says Holly (my name)… And it reminds me of so many friends that will randomly sing it to me all year through! I love O Holy Night. When I was little I would lie down on the sofa with the room lights out and watch the Christmas tree lights sparkle in the dark before my dad got home from work. I always played Christmas carols while I did this and whenever I hear O Holy Night I think of watching the lights while my mom made dinner. They are both gone now, so these memories are extra-special. O Holy Night because it touches the soul. But the Boston Pops playing Sleigh Ride is a close second. It just makes me feel like Christmas and all the good feelings associated with the season. Jingle Bells is my fave. I always think of how my daughter would sing it when she was 4 and make up her own words. Too cute! So many to choose from, but I will say JIngle Bells, especially when my son sings it. He puts great emphasis on the Heah’s! The twelve days of Christmas. I love hearing my little kids trying to sing the song. We have a lot of laughs singing it. I always break into a rendition of “It’s Beginning to Look a Lot Like Christmas” when I’m wrapping presents and putting out the decorations. This song makes me feel happy and full of Christmas spirit! Silent Night. It’s such a powerful song and to me it holds the true meaning of Christmas. My favourite has to be O Holy Night 🙂 It was always sung at our church’s Christmas eve service by a woman with such a beautiful and powerful voice… It was the last part of the service so we would leave with such a feeling of aww and peace. It is hard to actually decide on a favorite song because I love all Christmas songs. There is nothing better than a Christmas song to make you cheery! I guess if I have to choose, my favorite traditional song is Silent Night. However, I really love songs like Rockin’ around the Christmas tree, Blue Christmas (as sung by Elvis), and Winter Wonderland. I love Carole of the Bells. My local high school’s A Capella and bell choir does a fabulous job every year with this song. It isn’t Christmas unless I hear them perform just this one song. Silent Night, hearing it sung as a round when I was little. Also, Away in a Manger, all three verses, which I starting singing to my very young children at bedtime one year at Christmas, and continued to sing every bedtime for several years, punctuated by yawning. I love ‘Mary’s Song’. Gives me the goosebumps every time I here it, just thinking of what the birth of Christ must have been like from Mary’s perspective. silent night is my all time favorite!! i studied near eastern studies in Jerusalem while in college. we visited the church of the nativity in Bethlehem. there is a little church right next to it–i sang silent night in that church–i felt so much there–and i loved it!! me of the real meaning of Christmas! although of all the places I would like to be on Christmas (besides being home with my family) I would rather be at the BEACH! LOL! I love them all but O Holy Night is probably my favorite. Whenever I hear it I feel so blessed. Silent Night is probably my favorite. It’s that moment on Christmas Eve when the church turns out the lights, everyone is holding a candle, and you can feel the warmth and love as everyone sings this song together. It makes me cry every time! Gorgeous release! My favorite Christmas song is “Mary, Did You Know?” There is just so much meaning to it, and it really makes you think about her side of things! My favorite Christmas song is Little Drummer Boy because I used to play it on the piano when I was a little girl and sing it over and over…it reminds me of my childhood. O Holy Night! Just love it – have heard a lot of different versions and I seem to always love them all!! Oh my… I have several. I really like O Holy Night. On the lighter side, I love the 12 days of Christmas. I also love John Lennon’s So this is Christmas. Joy to the world, because it expresses the joy that Christ’s birth brings us. My favorite is Santa Claus is Coming to Town because my friend’s grandmother used to sing it to her on Christmas. Thanks for the opportunity to win such an amazing prize. My favorite would have to be Silent Night, especially during our Christmas Eve Service. Another favorite is What Child is This. Dumpty Diddle Dee Dumpty Dee I Can See A Christmas Tree. My Nan used to sing this to my Mum and now my Mum sings it to my son. He is absolutely fascinated with Christmas trees so it’s just perfect and I love it’s history within our family. I like Rudolph the Red Nosed Reindeer. It brings back such happy childhood memories. It’s easy to sing also!!! I love any Christmas Carol by The Carpenter’s… It always brings back memories of fun family Christmases with my 3 little sisters. All 4 of us know every word to every song on the Carpenter’s “Christmas Portrait” album! Silent Night is my favorite. It is the song we always sing in the candle light at Christmas Eve service. It always touches my heart. I love O Holy Night! It is such a peaceful and beautiful song. It’s beginning to look a lot like Christmas by Bing Crosby – because it’s nostaligic and makes me feel like I’m curled up by a fire while it’s snowing outside – love it! Mt favourite is called Te Haranui – it has a lovely soleful tune and is the story of the first Christmas that the Europeans had with the Maori people in New Zealand – on a sandy shore in the summertime. It is not like the traditional songs we sing at Christmas but meaningful to us here in New Zealand. I love the Twelve Days of Christmas. I love the tradition of that song. We sing it as a family taking turns singing what each day brings and have so much fun with that. My favorite Christmas Carol is “White Christmas” because it doesn’t seem like Christmas unless there is snow to me. Love the snow for the holiday! My favorite Christmas song is “O Holy Night”. I used to sing it as a solo in my church on Christmas eve.One year less than 12 months after my father passed away, I said a prayer just before standing to sing this song. I asked for some kind of sign that my father was okay. Right in the middle of my solo, the hymnal shelf fell to the floor with a loud thud. I surely got my “sign” that night! What a great question. My mom lives on a river and has always sung “Over the River and through the woods to Grandmother’s House we go” to my kids over the phone ever since they were babies. She is still called “Over the River” grandma to this day and my oldest is 10. Love that! Anything sung by Nat King Cole but I do love N’Sync’s “Merry Christmas, Happy Holidays”. Its so joyful and its really easy to dance to. Silent Night. It’s such a peaceful song, for what is such a peaceful season! Have Yourself a Merry Little Christmas. I’m not sure why, but I have always loved the song. I guess it makes me feel like no matter what Christmas is a special time to be enjoyed. I like all the religious Christmas songs but my favorite is Oh Holy Night. It reminds me of being in church with my family as a child and the choir was singing. I love the carol “do youhear what I hear?” especially the versuon sung by third day. Love the magical feeling about it! I Saw Mommy Kissing Santa Claus- for some reason this is the song i wanted thru my childhood and stuck with me. Winter Wonderland. . .just love that song! O Holy Night. Simply beautiful! I love Joy to the Wrold. I think it is so upbeat and fun. I Saw Three Ships – because it reminds me of my childhood! That would be like asking me to name my favorite child, if I had more than one. Mary, Did You Know? and When a Child Is Born are beautiful, inspirational songs that have moving words. Sinéad O’Connor’s version of Silent Night brings chills. Gabriel’s Oboe is a gorgeous instrumental. Let’s Be Naughty (And Save Santa the Trip) is a smooth and fun country carol. Santa Baby sung by Eartha Kitt is a classic that I need to listen to multiple times (think repeat). I can go on and on. Obviously, I listen to Christmas music year round. One of my favorites is “Mary Did You Know”. It’s a beautiful song and brings true meaning to Christmas. I really like God Rest Ye Merry Gentlemen. I think it’s the key and the fact that it is such a different style than the other traditional carols. Silent Night because of its beauty and feeling of the true meaning of the holiday. My fav Christmas song is Winter Wonderland…it just bright, merry & fun. Which is part of Christmas means to me. “Joy to the World” this song just reminds me of true meaning of Christmas. Thanks for all the stamps to represent this wonderful season. The Little Drummer Boy… it was my Mothers favorite.. I still can remember her singing and listening to it.. brings back wonderful childhood memories.. The one Christmas song that always moves me when I hear it is “Silent Night”. It was my father’s favorite, and always brings back sweet memories of him. If I had to pick one it would be “I’ll be Home for Christmas”. It always touches my heart and reminds me of our soldiers away from their familys. It will truely be a blessing when they are all home. THe Grinch song! It’s my fave movie too!